Fall is the perfect time to examine your trees, shrubs, and vines and come up with a pruning plan. 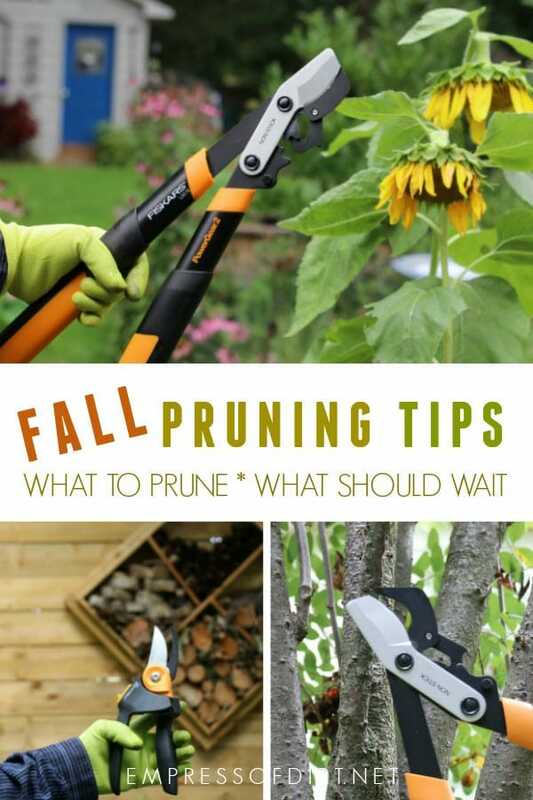 While most items should wait until winter, there are a few pruning tasks you can take care of immediately. 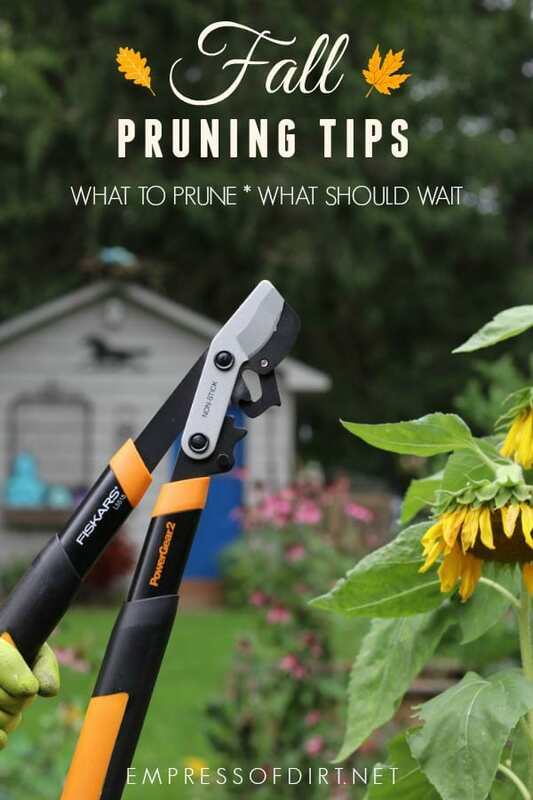 This is part of a series on How to Prune Trees, Shrubs, and Vines in your garden and how to choose the right tools. 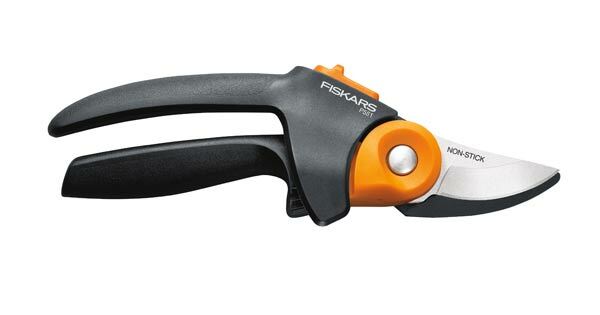 This article is sponsored by Fiskars who also provided the garden tools shown here. Content and opinions are entirely my own. With temperatures cooling and leaves dropping, fall is a good time to look over the trees, shrubs, and hardy vines in your garden and see what needs pruning. Most pruning tasks are best done in the winter or early spring when plants are still dormant and not budding or blooming. Fall is the time to clean up any dead, damaged, or diseased branches that may have gone unnoticed during the summer. Have a walk around the garden and examine the structure and health of each tree and shrub. 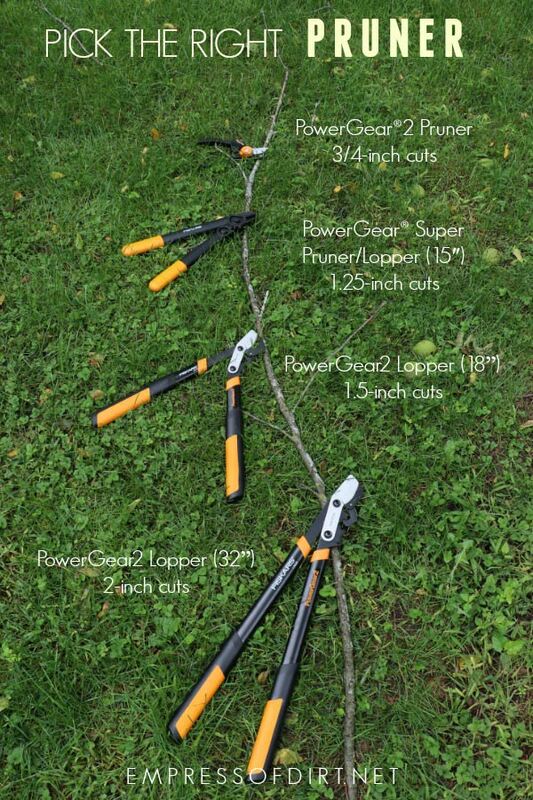 Here’s a basic system for determining which pruning tool is best for the job. First, it depends on whether the material you are cutting is living or dead, and the diameter of the branch. Bypass style pruners and loppers are best for living plant material, where we want to minimize impact on the remaining parts of the tree. 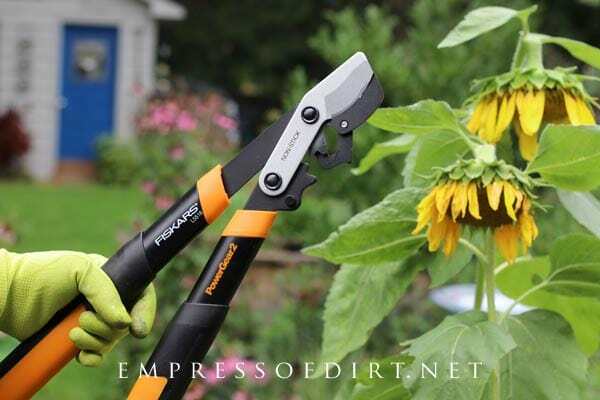 With their scissor-like blades, bypass pruners provide a nice, clean slice. Anvil-style pruners have a single cutting blade that clamps down on a flat metal plate. They work great on dead branches but should not be used on living material due to their crushing action. Personally, I use bypass pruners for all small cuts. The other consideration is the size of the branch you’re pruning. If you’ve ever tried cutting a branch with pruners that are too small, you know how hard that is—both for your hands and the tool. My must-have tools are small bypass pruners, medium loppers, and a good extendable saw so I never have to use a ladder. You know you’re using the right tool when it cuts easily—like a knife into semi-soft butter! PowerGear®2 Pruner cuts up to 3/4-inch diameter. 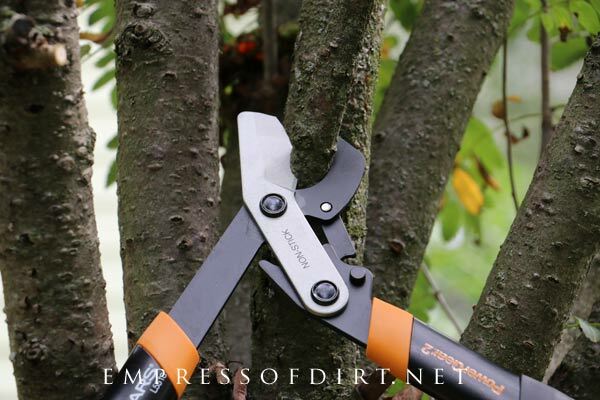 PowerGear® Super Pruner/Lopper (15″) cuts up to 1.25″ diameter. PowerGear2 Lopper (18”) cuts branches up to 1.5” in diameter. PowerGear2 Lopper (32”) cuts branches up to 2” in diameter. This extendable pruner/saw reaches 16 feet. It has two blades: one for smaller branches and another for larger ones. In fall, the goal is to remove non-living parts, branches that are damaged and vulnerable to disease, and those that have diseases. As tempting as it is, it is best to wait until winter to remove those annoying suckers, water sprouts, overlapping, and rogue branches. Unless a plant is dormant, the act of pruning signals the plant to grow, and you don’t want new growth in fall when the cold weather will soon kill it off. It’s far too easy to spread disease between plants with infected blades. While it sounds extreme, it’s best to clean your tools, and specifically, the cutting blades, before use, before moving from one plant to another, and after use. and should be thoroughly dried before use. I keep cleaning supplies handy in my tool storage area so they’re ready to go. Work in small, manageable bites: it’s safer and easier to remove longer branches in several sections. Be sure any falling branches will not harm you or your garden. Limit your pruning to less than 30% of the plant. This ensures the plant will have the vigor and resources to recover in good time. Pick the right tool for the job. Bypass pruners and loppers provide nice, clean cuts, and come in different sizes, depending on the maximum thickness of the branches you are cutting. An extendable saw is good option for any hard-to-reach and thicker cuts. 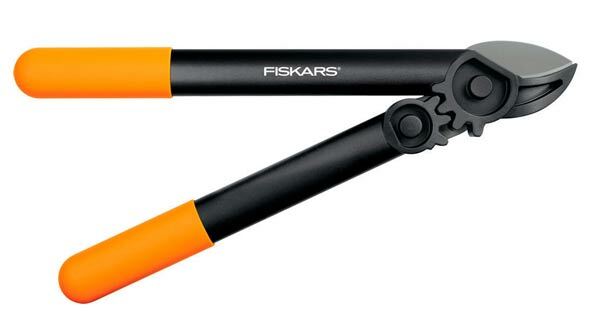 There is more information on pruning shears here at Fiskars. com. Entries must be received by October 31, 2018 at 11:59 pm EST. 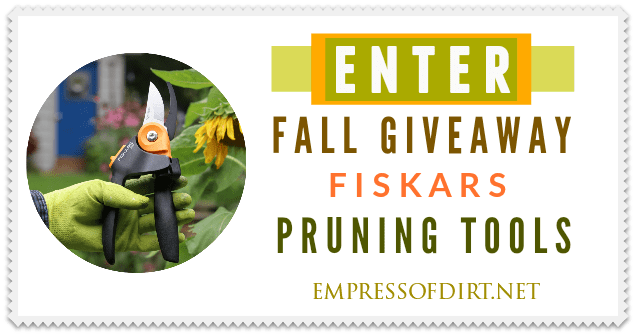 Prize: Four Fiskars pruning tools with an approximate total retail value of $175US. Prizes are subject to availability and may vary from those shown. 1 Read the sweepstakes rules and ensure you meet the requirements. 2 Leave a reply (comment below) with your US STATE or Canadian PROVINCE and tell us a favourite garden tip or words of encouragement for beginners. New comments are held for moderation and will not appear immediately. Tip add coffee grounds and bananas to beds for more rich soil. Los Angeles here. Important tip, place shade plants with shade plants, sun loving plants with others of same kind. Plants suffer if mixed up. tell us a favorite garden tip or words of encouragement for beginners. We all start somewhere, and learn as we go, gathering what works best along the way.